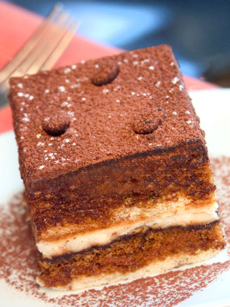 Mascarpone is the base of tiramisu. Photo by Kelly Cline | IST. This is Page 1 of a two-page article on mascarpone cheese. Click on the black links below to visit other pages. The first thing anyone needs to know about mascarpone is how to pronounce it correctly. It drives me crazy to hear people refer to it as “mascarpone,” especially when those people are food professionals who ought to know better! The correct pronunciation is mas-car-POH-neh. Out of respect to the cheese, this is the pronunciation I ask you to use. Mascarpone is worthy of that respect, in case you were wondering. While it’s sometimes called “Italian cream cheese,” it resembles one of those foil-wrapped bricks about as much as a butterfly does a chicken. 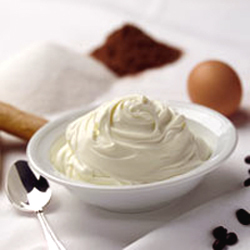 * Mascarpone is a soft, rich-as-Croesus cheese, ranging in butterfat content from 60% to 75%. It’s delicate in flavor, with a color rather like that of fresh cream. Although I’ve run across one source claiming that mascarpone is sometimes made from buffalo milk, I’ve never heard of it as being anything but a cows’ milk cheese. Mascarpone is most often associated with desserts, especially the classic tiramisu, but it can be used in savory recipes as well; it will add to the creaminess and flavor of a dish without overwhelming the taste. 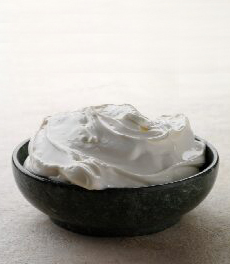 A bowl of mascarpone from the Italian producer Grifolatte. It is an extremely smooth, slightly sweet fresh cheese that is similar to Devon Cream or Clotted Cream. Mascarpone is believed to have originated in the Lombardy region of Italy, most likely in the late 1500s or early 1600s. 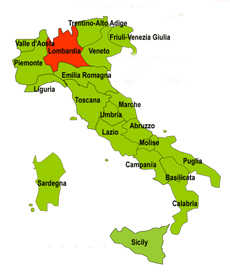 Lombardy, in the northern part of the country (see the highlighted area of the map—it includes the cities of Brescia, Cremona, Mantova, Milano and Sondrio), has a rich agricultural and dairy heritage. The name “mascarpone” may come from the Spanish “mas que bueno” (“better than good”), a holdover from the days when the Spanish ruled Italy. Another possibility (and, I think, a more likely one) is that the name derived from “mascarpia,” the local dialect term for ricotta, because both ricotta and mascarpone are made by very similar processes. A third possibility is that the name comes from the word “mascarpa,” a milk product made from the whey of aged cheese. In any case, it seems likely that the initial making of mascarpone could have been simply a glorious accident. *It is made from the cream of cow’s milk, but no cheese starter or rennet is used in its production. The moisture is drained from heavy cream using a small amount of citric acid and finely woven cloth. Yes, they really are brothers, and their surname is Crave. George, Thomas, Mark and Charles are award-winning cheesemakers in Waterloo, Wisconsin, now milking 600 Holsteins to produce a few cheeses for which they’ve become justly famous. This is farmstead cheese, meaning it’s made on the same farm where the animals live and are milked. In addition to the luscious mascarpone, the Crave Brothers produce two types of mozzarella (a fresh and a “farmers’ rope” of part-skim) and a washed rind cheese called “Les Frères” (get it?). The lid of eight ounces of heavenly mascarpone. Image courtesy Crave Brothers. This is not any old mascarpone, I can tell you. The first time I tasted it, at an American Cheese Society conference, it was all I could do not to burst into song. This is a delicate, fresh, dreamy mascarpone, smoother than Don Juan himself. The label states “Take me home and taste the sweet cream difference,” and that’s not just an empty promise. This mascarpone is lick-it-right-off-the-spoon good. It will make your tiramisu soar to new heights and your risotto dance. Crave Brothers sells their cheeses (especially the mascarpone) in some upscale markets, but the mascarpone is also sold online at Rothkase.com. A dish of creamy heaven. Photo courtesy Wisconsin Milk Marketing Board.